Cursed Lands is available for pre-order! What if I told you you can get 37 books for the low price of 99¢—15 now and 22 later? You wouldn't pass up a deal like that, would you? Me neither! 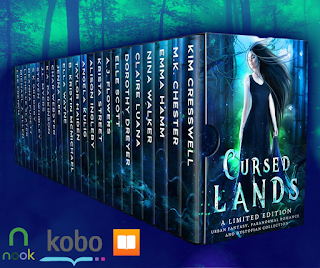 Don't miss out on the Cursed Lands boxed set, filled with amazing urban fantasy, dystopian, and paranormal tales that will leave you breathless. Enjoy your trip into Cursed Lands. See you on the other side!